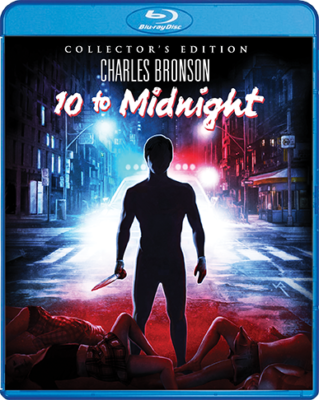 The most surprising movie of this week is the 1983 Charles Bronson-starring slasher-thriller 10 TO MIDNIGHT, which has been restored by Scream Factory for a collector’s edition. It’s a firecracker of a film that has a pulse-pounding serial killer story (which may or may not be based on Ted Bundy), great performances, well-written dialogue and a nice pace that never lets its guard down. Directed by J. Lee Thompson (THE GUNS OF NAVARONE), 10 TO MIDNIGHT involves a veteran homicide detective (Bronson) who is trying to track down a handsome young man (Josh Brolin-lookalike Gene Davis) who has been seducing and knifing many young women to death. 10 TO MIDNIGHT seems like a film that inspired filmmakers like David Fincher (SE7EN, which the movie has a lot in common with). It seemingly has Fincher’s style of narrative, which cuts out the fat and focuses on the good bits only. Even the film’s most ridiculous moments are great. Take, for instance, one sequence where Bronson’s character’s partner (a terrific Andrew Stevens) kicks open a door thinking he’s discovered the killer caught in the act. However, it’s just a couple at a party engaging in some sexual activity. How Stevens’ character reacts to that situation will have you in stitches. So, the movie has a little bit of everything — romance, comedy, drama and horror. And how it weaves in and out of those genres is outstanding. Extras: The Scream Factory Collector’s Edition (now available on Blu-ray through shoutfactory.com/shop) includes a cardboard slipcover and reversible cover art designed by Joel Robinson. It also includes a 4K scan of the original camera negative (although, there are a few parts where certain angles have a strobe effect from a poor rendering); new interviews with actors Andrew Stevens (he has some good stories about working alongside Bronson), Robert F. Lyons and Jeana Tomasina and producer Lance Hool; a new and insightful commentary by author Paul Talbott; audio commentary with filmmakers and a film historian; a theatrical trailer; radio spots and a still gallery. In 1975, director Richard Donner (THE GOONIES) took what would’ve been a throwaway made-for-TV movie and crafted a rather exceptional film that raises awareness about teenage alcoholism. It stars THE EXORCIST’s Linda Blair as a 15-year-old who is struggling to fit in and turns to alcohol to drown her sorrows. But it’s much more than, too. Although the film can be very dramatic at times (given that it’s a TV movie), it makes up for the fact by delving into complicated human relationships, the plight to find one’s identity and the negative effects alcohol can have. It’s a pretty daring movie, to say the least, most notably toward the end of the film where we reach rock bottom with our main character. I honestly don’t know if I will be able to shake one image, in particular, that involves a horse. It doesn’t hold back in its delivery of the truth, and that makes it super admirable. It should be mandatory viewing in high schools. Extras: The Shout Factory release (now available on Blu-ray through shoutfactory.com/shop) includes new interviews with Linda Blair (she talks about her career shift from THE EXORCIST to this and how she approached the character) and director Richard Donner and producer David Levinson (an enjoyable convo about how the film came to be and how it shaped into the bold film that it is).